Dinner: Tuesday - Thursday, Sunday: 5:00pm - 10:00pm, Friday - Saturday: 5:00 - 11:00pm. We are an Italian restaurant and bar. We emphasize in Tuscan culinary traditions and seasonal ingredients from the Pacific Northwest. The staff were great but our meal was marred by finding part of their cleaning sponge (steel wool) in our halibut broth. It’s hard to forget that you just ate a meal that had cleaning parts in it and whatever was being cleaned. I mean that’s disgusting. They gave us free dessert but we were there for my sons birthday so getting free dessert is fairly common. I would have expected the halibut to be comped at a minimum. I still get grossed out just thinking about it. We were there for restaurant week for the first time. Food was really good. I love burata cheese and roasted cauliflower dish. Outstanding service, food and wine. Even though we were late and with 2 fewer people, the greeting and service throughout were fantastic. Burratta, pastas, and hanger steak were beautifully prepared, seasoned and of good value for restaurant week. The Lopez Island clams with chorizo were as good as I have had in all of Seattle. Its worth coming just for that. Reservation booking was made for 8 pm. Upon arrival was advised that they were slightly behind and should not be more then 10 minutes. At 8:30 PM while still waiting at the bar I confronted the Italian manager and told him that we were fed up and could have booked anywhere else for 8:30 pm. Bottom line the restaurant overbooked and gambled on a frequent guest. Despite comping the wine glasses and providing us with a complementary starter the damage was done. At the end of the meal the manager didn’t even bother to come by and apologize again. At this stage we question if we are going to visit the restaurant anytime soon. Truly delicious food. Friendly and helpful waiter. We were there for restaurant week when they were slammed and it was still friendly, savory, generous, pleasant. I want to go back on a regular day! It was loud because it was full of people talking (good loud). They weren’t playing thumping music (bad loud). the apps were quite good. the deserts (donuts and the lemon tart) were both excellent. The food and service were excellent. Unfortunately, it was so loud that it was difficult to have a conversation. Hesitant to write a review, because then people will know how great Cantinetta is and they might make it harder for me to get a table! Cantinetta is my favorite Italian restaurant in all of Seattle. Nothing beats the Bolognese or the Zeppole - NOTHING! Plus the ambiance is perfect for anything (group, date, family, Tuesday). It's cozy and understated. We most recently dined for a birthday and they had a glass of sparkling waiting for the birthday girl (just as I had requested in my reservation). We simply love Cantinetta. A great neighborhood restaurant with a service team that recognizes us as repeat customers. The food is always beautifully prepared and the wine list provides great value. The beef carpaccio with shaved black truffle just added to the menu was the best I have had anywhere in the world. Great food, a but pricey. Super loud so very hard to have a conversation. Excellent neighborhood spot you’ll always want to come back to. Squash angliotti with sage butter was A+. Roasted cauliflower, short ribs, mussels, roasted veggies were all real fresh and delicious. Randy at the bar is a lot of fun too! This was our second visit. For America, Cantinetta is a good Italian restaurant. Sometimes very good but certainly not excellent. On the good side, the dishes are more imaginative than most American Italian restaurants. That's a big plus, as most American restaurants are too scared to try something different and tend to be formulaic. So thank you Cantinetta for daring to be different. Additionally, your ambiance achieves individuality and a degree of intimacy albeit very noisily. On the downside, the food was prepared in a fairly heavy-handed manner. Our pancetta-wrapped dates were still cold and hard in the middle though crisped on the outside. Certainly not the melt-in-your-mouth sensation they can be. The pork belly on pureed root vegetable and apple was very average - the pork belly was almost entirely pork fat, and served on mush. It lacked variation in texture and presentation. The bolognese sauce was kind of boring, though the pappardelle was nicely made and cooked. Authentic pasta is always appreciated. The pici pasta was dense and could have been good but was way over salted. The veal meatballs were nothing exciting. Perhaps we just ordered the wrong dishes but we got the impression that, although the dishes are named after interesting Tuscan recipes, they have been given a pan-American overhaul to make sure that nothing raises it's head too high or steps too far out from the American taste spectrum. Cantinetta was busy when we arrived and we were happy to wait for a table, which became available 15 minutes after the time of our reservation. We were fine with that given how busy the restaurant was. We received good service for our meal. Overall, our family enjoyed our meal but have eaten much better meals from Italian restaurants, albeit not in the US. We did not eat at Cantinetta. We arrived, and the noise in the restaurant was absolutely deafening. It’s basically one small room, packed with diners. They seated us within five minutes, which we appreciated. But it was our wedding anniversary, and we could not even hear each other speak unless we literally yelled across the table. We decided that despite all the great reviews of the food, it was a sonic nightmare and we left. We don’t feel it’s appropriate to review the food, but we will never return to this place. The ambiance and mood of the restaurant was lovely, however the restaurant was loud. We were seated 30 minutes after our reservation. The food was good. Dessert was great. What a perfect place to celebrate my wife's retirement and last day of teaching. Incredible staff - attentive but not hovering, and spectacular food. Can't wait until they get the sidewalk tables set up! Our waitress was friendly and up for the challenge when we told her to pick apps, meals and wine for our party of 4. Her food selection was great and everything was tasty. The dining area is a not large but was comfortable. We were seated near the door which could be a little chilly depending on the weather and number of guests arriving and leaving. It wasn't our visit so we had an idea what to expect and will definitely return. This place is consistently awesome with delicious food and great service. Love this neighborhood spot. Always a delight in food, ambience and value. Not too loud; great service and mostly great food! The bolognese sauce was excellent and it was a nice ambience. We also had roasted cauliflower and root vegetables, both excellent - and the bread was yummy and fresh also. My husband did not rate the chicken as highly. I would go there again! 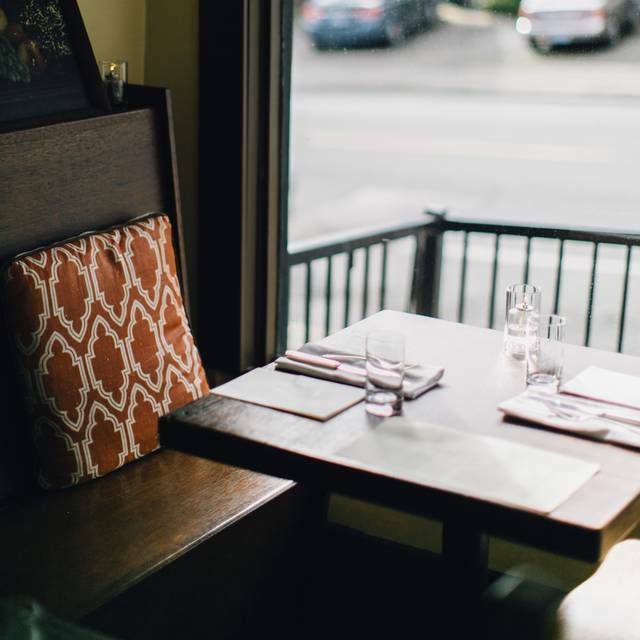 This restaurant was one of our favorites in Seattle. After dining here on our anniversary, were are not so taken with it any longer. While the food was good and fresh, the server was unmemorable except for her lack of personality. Typically the staff has been warm, welcoming, and very helpful if we wanted a small modification to our food. The server was not slightly interested in helping me make a change to my dish and simply said the menu changes weekly (which seriously we know since we have eaten here at least 6 times). She was surly, and did not manage to make it back to refill our wine glasses from the bottle even once during the meal. Even though we mentioned in our reservation that it was our anniversary, the only person who acknowledged it was the gentleman who seated us and refilled our water ( he has been super pleasant and helpful on everyone of our visits). Will be back again soon! Excellent service and food. Great ambience for a date. Loud. The only gluten-free choice among the Second courses is the risotto, which is underwhelming. Food was delicious, and the waiter was great. However, the noise level increased to uncomfortable levels as the restaurant filled up. We finally left because we could no longer carry on a conversation. My husband said he won’t go back. As always Cantinetta Seattle/Wallingford doesn't disappoint as a wonderful neighborhood gem and spot to get fantastic Italian in Seattle. One of the best meals I have enjoyed in a long time. The food was amazing and the service very good. Cantinetta is always delightful. Service was warm and quick. The donuts are so amazing. We had the most amazing meal! We started with carpaccio which was exquisite, with the perfect blend of textures. We each had an insalata mista to get us ready for our shared plates. First was the agnolotti - this was easily the best pasta I have EVER had. The squash filling with the brown butter - I savored each little bite to make it last! Next we had the short ribs. These were tender and juicy and delicious. Lastly we had the zeppole, also incredibly good. Our server Amy was amazing, helped us to make all the right choices and never left us wanting. This was my 4th visit to Cantinetta, and it won’t be my last! Last night (Valentines Day!) was our first time trying this local treasure and W O W!! We will be back. When we arrived for our reservation we were greeted immediately. We did have to wait about 10 minutes for our table (understandable, it's a romantic holiday) so we were seated at the bar while we waited. The bartender was attentive and made excellent cocktails, and the seating was cozy. We were seated quickly, and offered bread, which was also delicious! I ordered the pici which was one of the most delicious things I have ever eaten, and a glass of the house wine (also tasty). Overall I would say Cantinetta is worth it. The service is fantastic, and the food even better! Staff was nice enough to accommodate us earlier than our scheduled reservation. The food was very good! As a repeat diner, I love this place! Upon arrival, we always feel welcomed and the food is consistently delicious. Pasta is always perfectly cooked, salads are fresh and not over dressed and the wine list is reasonably price with great selections. Oh and there is the consistent, professional, knowledgeable wait staff. Attentive but never overly so. Perfect. Love this neighborhood place! This was my second visit here with my girlfriend, and both times everything has been amazing. We got the avocado and pork belly appetizers and both contained such amazing combinations of flavors. For the entree, I got the rigatoni with spicy sausage and it was outstanding. Al dente pasta eith the perfect amount of sauce. My one complaint is that I only got one chili in my dish (probably intentional) but it was so delicious I wanted to eat another. My date got the butternut squash ravioli with brown butter sauce, which was equally delicious. The food is by far the highlight of our experience, as a restaurant experience should be. The service has a very casual feel to it, but still remains very efficient. We never wanted for anything. I especially appreciated how our waters were never left empty. Some restaurants are horrible about that. We will definitely be back for future special occasions or casual nights out. It’s a new favorite! It was excellent. All of the dishes were celebrations of flavor, with great service and drinks as well. Second time I’ve come here with very mediocre service. Also 2 of the 4 main entrees were nothing to rave about. The oso bucco was very dry and boring, and the risotto was far too salty. The rigatoni was delicious. Overall disappointed. This place never lets us down. The food is delicious, the service consistently excellent. A lovely place for a date, dinner with friends, business dinner. Anything! Incredible fresh made pasta dishes. Service always welcoming. Our favorite go to restaurant! This restaurant is exquisite. Definitely a foodies paradise! Love this restaurant. The pasta is made fresh and I have never had a bad dish. Service great. Cocktails are excellent and wonderful wine list. Really one of my favorite restaurants in Seattle. You must try it. You will not be disappointed.